There are many HMI lights made around the world but none better than the Swiss Made Kobold. The DW800 HMI production light is fully focusable and designed as a multi-purpose daylight with a wide focusing range from 12 to 70 degrees. 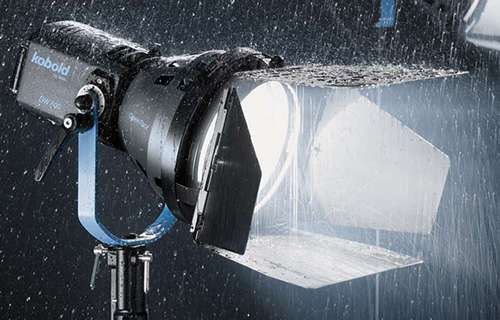 Kobold is available in the following lamp sizes 200/400/575/800/1600 Watt with interchangeable reflectors using Open Face, PAR or Fresnel with a IP54 Rating so the lighting kit can be used in the rain or snow conditions. For the popular DW800 there is a focusing rotary knob which is ergonomically positioned that gives the lighting technician easy access for quick focusing during production. With Kobold high build quality the lamp housing is manufactured from high-strength aluminum, and has a lockable mount for single-ended HMI/MSR lamps with a high degree of efficiency. Kobold has pioneered innovative technology over many years, that sets the gold standard with the latest surface mount circuitry technology with high temperature rated components, which guarantees the ultimate in functional and reliability even in difficult weather conditions such as low temperatures at sunrise or the relentless midday heat in a tropical location. If you are considering purchasing a Flicker Free HMI, then demand quality, please give us a call us , to light up your next production.